It’s Christmas Eve and I’m starting a five-night observing run at the Keck Telescope using a high-resolution spectrograph (HIRES) to search for exoplanets. 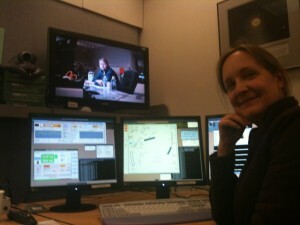 In the photo here, I am communicating with the telescope operator, Terry, by polycom. He is on the summit of Mauna Kea at 14,000 ft where the air is thin and I see that he has oxygen flowing. I’m glad that I’m working in comfort at Keck HQ in Waimea. Tonight, I’m using the Doppler technique to measure the velocities of stars. Orbiting planets tug their host stars around a common center of mass. This reflex stellar velocity is largest for massive planets. When small stars eclipse larger stars, the brightness dip can be virtually the same as those for transiting gas giant planets. To confirm a transit candidate as a planet, Doppler measurements are needed to determine the mass of the transiting object. The Kepler team has a massive follow-up campaign (led by Dr. Geoff Marcy at UC Berkeley) using the same setup that I’m using now. Dr. Natalie Batalha (Deputy Scientist for the Kepler project) explains that the team is also eager to have others helping and to have Planet Hunters combing through the data. Watch for a blog post by Dr. Batalha here soon! Some of you have asked how many consecutive low points you should see during a transit. That depends on how close the planet is to the star. Close planets orbit faster and transit in a few hours while more distant planets take several hours to transit. You should look for more than one low point. Since the brightness measurements are taken every 30 minutes, a 3 hour transit would consist of just 6 low points. However the ingress, or first transit point, might be transitional and not reach the transit floor. Ditto for the egress, or last transit point). The light curves for eclipsing binary stars are quite spectacular – they remind me of sketches I used to make with a “spirograph” toy I had as a kid. Some of the planet hunters have called this a shutter effect and I’ve written a quick program to demonstrate what is happening. In the Figure below, I created a theoretical light curve for a contact eclipsing binary with an orbital period of just 6 hours. If we had observations of this star every few minutes, then the light curve would look similar to a sine wave (left plot). However, if we observe this star less frequently (a slow “shutter speed”), then some interesting patterns emerge. The plot on the right in the Figure below shows an under-sampling of the light curve over 30 days. The pattern is similar to what appears in some of the eclipsing binary curves you are finding in the Kepler data. I’m Debra Fischer, a Professor of Astronomy at Yale University. Many of you have already discovered some amazing eclipsing binary light curves, and we wanted to provide you with some information. The Figures here show examples that you have put into collections. Some great additional examples are shown in a paper from the Kepler team (Prsá et al. 2010 http://arxiv.org/abs/1006.2815). 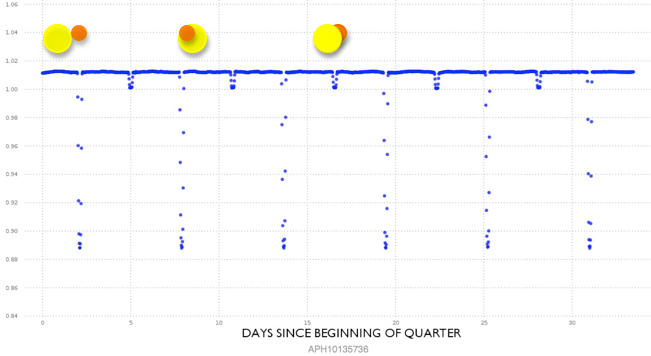 The Kepler light curves show how the brightness of the star changes with time. In Figure 1 (APH10135736 = KID 6449358) above, there are two stars orbiting each other. Similar to transiting planets, these stars cross in front of each other. The light curve shows the brightness level of the star, plotted vs time in days. Most of the time, both the larger, hotter star and the smaller cooler star yield a combined brightness measurement for the light curve. When the deep dip in brightness (the primary minimum) occurs it’s because the smaller cooler star is eclipsing the hotter star, which contributes most of the light; when the smaller dip (secondary minimum) occurs, it’s because the larger hotter star is eclipsing the smaller star, which contributes less light to the combined brightness. Stars with flat regions punctuated by relatively sharp dips (e.g. Figure 1) are known as Algol binaries. A key indicator of eclipsing (or transiting planet) light curves is repeatability. Notice that the depth of the brightness dips for an eclipsing binary star can be similar to those for a transiting planet. The transit depth tells us the ratio of the size of the transiting (or eclipsing) object relative to the size of the primary star and the smallest stars have diameters that are similar to Jupiter (stars are gas and the increased gravity from the larger mass star compresses the structure). Sometimes binary stars are so close that the surfaces are distorted into an elliptical shape and the light curve between the eclipses is rounded, as in the left image of Figure 2 (APH10039007 = KID 9357275), where the orbital period is a little more than one day. You can see both the primary and secondary transit dip in this light curve. The most bizarre eclipsing binary light curves are those where the stars are even closer together, called over-contact binaries. An example of this is shown in the right image of Figure 2 (APH10102932 = KID 4633285). These stars can be so close together that they share a common envelope. The eclipse depth is variable, the light curve looks irregular, and there can be mass transfer between the stars.